Onions are widely consumed in our daily diet. 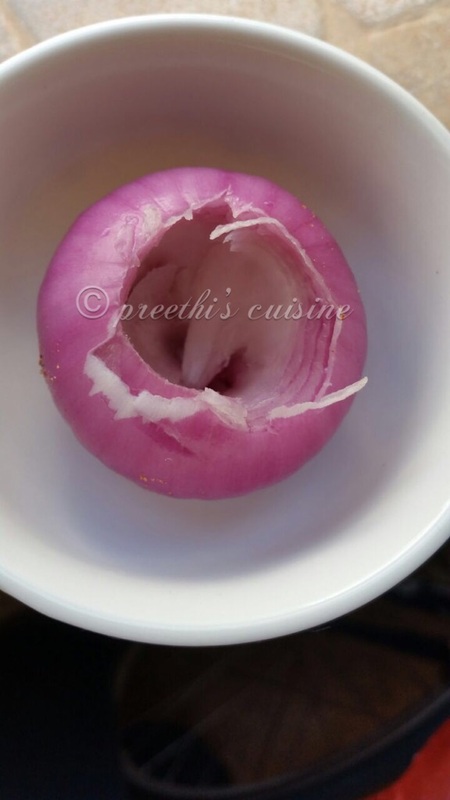 It is one of the most vital ingredient in our cooking.Well there are many recipes without onions. All onion lovers will just love it. It is worth a try and I bet it will be a regular feature on your list. Did you know that Onions are high in vitamin C, a good source of fiber, and with only 45 calories per serving, add abundant flavor to a wide variety of food. Onions are sodium, fat, and cholesterol free, and provide a number of other key nutrients. Well I wanted to cook something different,yummy ,healthy and easy too. So thought of experimenting again. Yes my experiment was successful. I have tried with a very basic masala stuff. We can stuff scrambled paneer/eggs ,bread crumbs, brown rice etc for Vegetarian and scrambled eggs, Minced meat etc for Non-vegetarians. There are plenty of options. Peel the onions. Scoop the centre (see the pics).Mix all the dry masalas mentioned above. Stuff the onions with this masala. Heat a pan. Add a tsp of oil, Add ½ tsp jeera. Add the stuffed onions and roast all the sides well. It will take 20 to 25 mins to cook.Please ensure it is a little crunchy and not too soft. Garnish with chopped coriander. Grease a microwave safe bowl. Place the stuffed onions in the greased bowl. Microwave on high (800 w) for 2 mins. Add the extra masala if any and microwave for 1 more minute. The stuffed onions are ready. 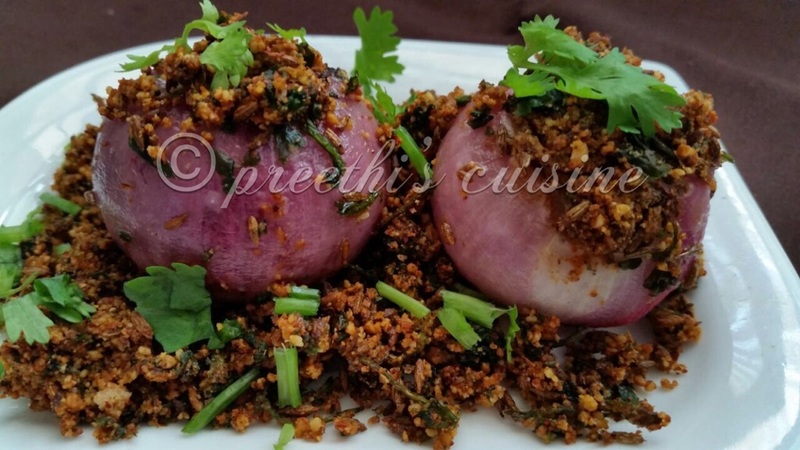 Stuffed onions goes well with rice. I can just eat it without rice or rotis. Interesting! 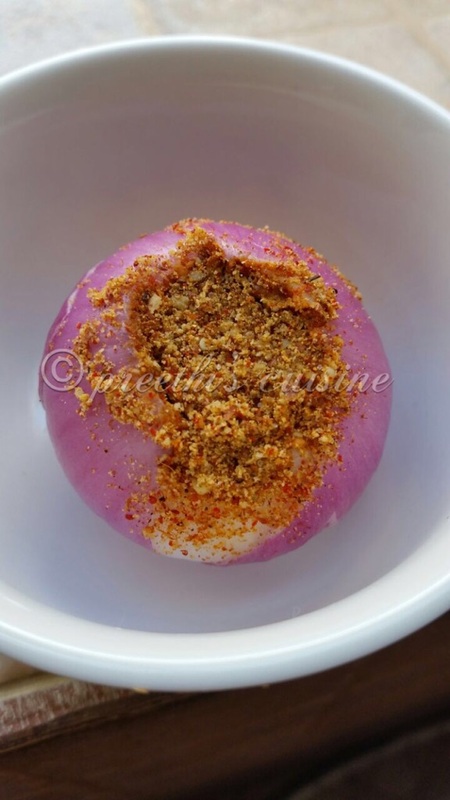 We’ve never had stuffed onions before! Thanks for linking up to #MonthlyMasala! Very creative Preethi. It is a unique dish. Looks so yummy. These look so healthy and delicious. Thank you Abblasha. It tastes yumm. Do try and I am sure you will love it. 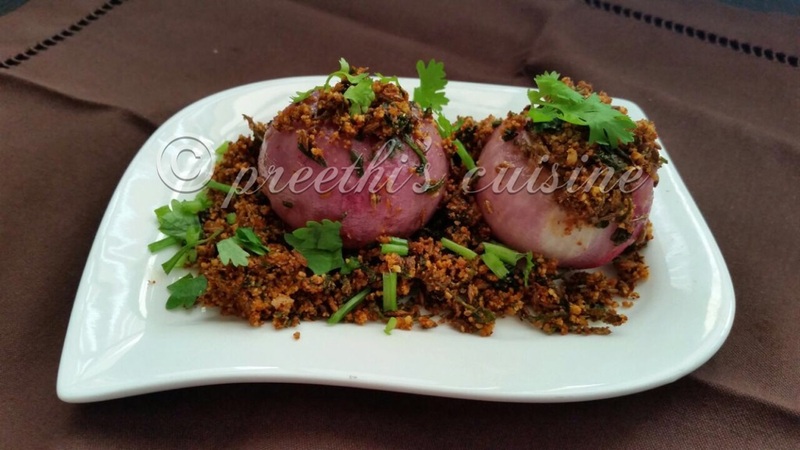 Stuffed onions looks superbly delicious Preethi. Loved it. I would love to have it with steamed rice. Loved the microwave method. Superb share.